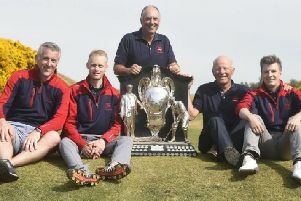 Royal Burgess man Malcolm Pennycott was left kicking himself after letting George Duncan off the hook then seeing his conqueror reach today’s 36-hole Scottish Amateur Championship final at Royal Aberdeen. Pennycott, who hails from Arran but has lived in Edinburgh since studying at Heriot-Watt University, looked to be heading into the semi-finals in the Granite City as he stood three up with five to play. But the 26-year-old saw a likely victory become a painful defeat as he lost the 14th and 16th to pars, the 17th to a birdie-2 then the last with another bogey. In fairness, his attempt from around 10 feet to force extra holes was a bit unfortunate as it lipped out, leaving Duncan to progress and then make it to the final against Nairn’s Andrew Burgess with a 20th-hole victory over Elderslie’s Alasdair McDougall. “I’ve had a brilliant run this week and thoroughly enjoyed it, but, at the same time, it’s frustrating to be up to the quarter-finals and not be able to see it through,” admitted Pennycott.